Michael Kors has launched Island Palm Beach, the fifth and latest flanker to 2005's Michael Kors Island. As Kors noted, Palm Beach is "the closest thing America has to Capri". Bursting with sunny brightness, the fragrance opens with a cocktail of pink grapefruit, succulent tangerine, and sweet orange juice. The heart of the fragrance seduces with notes of jasmine and a dash of rum. Hints of black tea and pink pepper provide an ultra sophisticated edge. A drydown of luxurious vanilla ensures that the dream lingers well after the sun sets. That’s some retina-splitting neon green, yikes. They really should have shot it on a white background. Yikes is right. fruits in rum and black tea, seasoned with vanilla? sounds delicious, gotta hand him that. I don’t know whether I want to drink it or wear it. In any case, it sounds really good. I keep meaning to try this line as I generally love tropically themed (or island themed in this case) scents. Are they fairly well done for that sort of thing? Reasonably well done, in a very mainstream way, yes, although some of them have been better than others and don’t think any of them were as good as the original Island. Agreed Robin… The Original Island is still the best, But Capri Is REALLY REALLY Good, My mother owns it and I LOVE the way it smells on her! all the Island Fragrances are Rather more on the Higher End of Good. All very Well done, All Impressive Compositions… Earth Shattering… Hardly, but not much is anymore! LOL! will get this when I can find it. I really like the Bermuda the best so far. This sounds interesting. I suppose I should try the line. this sounds LOVELY! 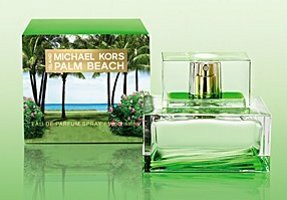 love all the Michael Kors Fragrances, and this one sounds like one of the best of the “Island” Flankers… can’t wait to get a whiff! This does sound nice…I have to admit that I love Kors as a designer but have not liked any of his scents so far. This might be the exception – I can only hope! I’ll look forward to trying it. I feel I would love it! Just got this today from Ulta. Disappointingly nondescript.